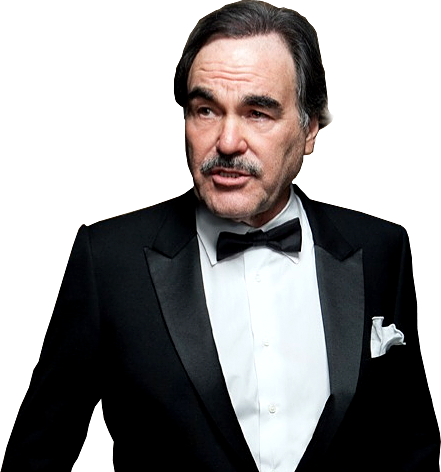 Oliver Stone has been credited with writing and or directing over 20 full-length feature films, earning him a well-respected place in cinematic history for some of the most influential and iconic films of the last two decades. Throughout his long career, which began at a young age writing short plays for his family, Oliver Stone has served as director, writer and producer on a variety of films, documentaries and television movies. He is widely recognized for his controversial versions of recent American history, some of them at deep odds with conventional myth -- films such as 1986's “Platoon,” the first of his Vietnam trilogy, or 1991’s “JFK” and 1994’s “Natural Born Killers” and “Nixon,” his 1995 take on the finer points and parables of the Nixon administration, as well as on George W. Bush in “W.” (2008) Stone says his films are "first and foremost dramas about individuals in personal struggles," and considers himself a dramatist rather than a political filmmaker. Stone was the only son of Louis Stone, a successful stockbroker and financial writer, and Jacqueline Goddet, a French student his father, then in the Army, eloped with as a war bride in Paris in 1945. He grew up in New York, and spent quite a bit of time with his maternal grandparents in the France of the 1950s. Stone attended Trinity School on the west side of Manhattan and later attended, for 4 years, The Hill, a boarding school in Pottstown, Pennsylvania. Stone attended Yale University in 1964-65 but dropped out after one year. In June of 1965, as the first U.S. troops arrived in Vietnam, Stone taught at the Free Pacific Institute, a Catholic high school in the ethnic Chinese district of Saigon. In 1966, he signed on to the U.S. Merchant Marine, where he worked as a “wiper” in the engine room below deck on several ships. His travels took him from Asia back to Oregon and then Mexico. In Guadalajara, he began writing a first novel, a 1,400-page manuscript entitled "A Child's Night Dream". He later reedited the novel down to a manageable 236 pages, which was released 30 years later by St. Martin’s Press (1997). In 1967, Stone enlisted in the United States Army and served in the 25th Infantry Division near the Cambodian border, where he was wounded twice, and then later in the 1st Calvary Division in the northernmost part of Vietnam. He was honored with a Bronze Star for heroism and Purple Heart for his service. After graduating in 1971 with a Bachelor's degree in Fine Arts, Stone worked many jobs, among them a cabdriver, messenger, sales representative, and production assistant, while continuing to write screenplays. With a Canadian production company, he made a low-budget horror film called “Seizure” -- about a fantasy writer whose characters come to life. With a budget of $150,000, “Seizure” was released,after many difficulties,in 1974. The film's overriding theme of psychological trauma proved to be good preparation for Stone's next major project, which was his breakthrough in the 1978 film Midnight Express, based on the real-life story of an American College student jailed in a Turkish prison for trying to smuggle drugs out of the country. The film, and Stone himself, received controversial reviews and criticism. However, the low-budget film was a gigantic commercial success world wide, and received five Academy Award nominations. For his work as the film's screenwriter, Stone won his first Academy Award, for Best Adapted Screenplay and was also honored with a Golden Globe Award. a suspense/horror film entitled “The Hand” starring Michael Caine. In this period, Stone also wrote “Conan the Barbarian” (1982), “Scarface” (1983), and Michael Cimino's “Year of the Dragon” (1985). Stone's next directorial effort, “Salvador,” explored the various politics at play during the early-'80s war in Central America. He was also the co-screenwriter for the film, based on the story of American photojournalist Richard Boyle Salvador. Stone received international acclaim the following year for the movie Platoon, for which he drew on his personal experiences to redefine the way in which the Vietnam War was portrayed on film. Stone effectively opened the way for a new -- albeit controversial -- approach to looking at the war, and in so doing, he solidified his reputation of creating films of a more realistic nature. David Halberstam, winner of the Pulitzer Prize for his coverage of the Vietnam War, proclaimed “Platoon” as "the first real Vietnam film and one of the greatest war movies of all time." The film became the third-highest grossing film that year and won Stone his first Best Director Oscar as well as several other awards, including the Oscar for Best Picture. In 1987, Stone continued his success and critical acclaim with “Wall Street,” his first big-budget project. A tale of greed, corruption and power, the film won a Best Actor Oscar for star Michael Douglas. After completing Talk Radio in 1988, Stone went on to make the second installment of his Vietnam trilogy, Born on the Fourth of July (1989). The film received a large dose of enthusiastic acclaim and a second Best Director Oscar for Stone, as well as seven other nominations, including Best Picture and Best Actor for Tom Cruise. Two years later, Stone directed two more films profiling famous, and perhaps infamous, figures. “The Doors” was a drug-saturated biopic of legendary and controversial singer Jim Morrison starring Val Kilmer in the lead role. “JFK” presented Stone's conspiracy-theory approach to the assassination of John F. Kennedy and the large cast featured such well-known names as Kevin Costner, Tommy Lee Jones, John Candy, Joe Pesci, Donald Sutherland, Jack Lemon, Sissy Spacek, Gary Oldman and Walter Matthau. “JFK” incurred a lion's share of controversy for its heated subject matter, but it secured eight Oscar nominations, including Best Director for Stone. “Heaven and Earth,” which presented the war through the eyes of a Vietnamese woman, Le Ly Hayslip (from whose autobiographical writings the film was adapted). Stone's next directorial effort, “Natural Born Killers” (1994) was attacked for its glorification of violence. A story of serial killers, played by Woody Harrelson and Juliette Lewis, the film was named the eighth most controversial movie of all time by Entertainment Weekly in 2006. The following year, Stone co-wrote and directed “Nixon,” an epic take on the title character's presidency that earned four Oscar nominations. In 1997, Stone directed U-Turn, starring Sean Penn and Jennifer Lopez. Stone also produced such films as “Reversal of Fortune” (1990), “The Joy Luck Club” (1993), “The People vs Larry Flynt” (1996), Savior (1998), “Freeway” (1996), “South Central” (1992), and “Wild Palms” (1993) for television. In 1999 he again took a seat in the director's chair with “Any Given Sunday,” a football movie starring Al Pacino, Cameron Diaz, Jamie Foxx, and repeated collaborator James Woods. Stone went to Cuba for his first documentary -- on Fidel Castro -- entitled “Comandante” in 2003. After covering the current state of the Palestinian conflict in the same year's “Persona Non Grata,” Stone traveled back in time to study yet another great conflict with war drama “Alexander” in 2004 (a revised “Alexander Revisited” was released in 2007). Stone's follow-up in 2006 was “World Trade Center,” a true story about two New York Port Authority policemen, who were on duty and trapped in the rubble on September 11, 2001. Stone directed in 2008, “W.”, a chronicle of the life and presidency of George W. Bush, while Bush was still in office. His documentary work includes two follow-up films on Fidel Castro -- “Looking for Fidel” (2004) and the upcoming “Castro in Winter” (2012) -- as well “South of the Border” (2010), a roadtrip across Latin America meeting seven of its progressive leaders. one of his films, “Wall Street: Money Never Sleeps”, with Michael Douglas reprising his Oscar-winning role. Shia LaBeouf, Josh Brolin, Carey Mulligan, and Frank Langella also starred in the film. Stone co-wrote and directed the upcoming “Savages,” an action-packed story of three SoCal friends going up against the Baja cartel to be released July 6, 2012. He also co-wrote and directed the upcoming 10-hour documentary series “The Untold History of the United States,” which will air on Showtime in 2012.